It has been more than a decade since a baby was born HIV-positive in San Francisco. This is no small feat, considering transmission of the disease from untreated HIV-positive mothers to their children used to occur in one of every four cases. Thanks in large part to groundbreaking research from the unique partnership between UC San Francisco and San Francisco General Hospital and Trauma Center (SFGH), researchers are now focused on finding a cure for HIV, a disease that first emerged as an almost certain death sentence. “The roots of the remarkable progress in HIV medicine over the last three decades can be traced to the partnership between UCSF and SFGH,” said Diane Havlir, MD, a UCSF professor of medicine and chief of the HIV/AIDS Division at SFGH. The newly constructed San Francisco General Hospital and Trauma Center will open in 2015, providing an updated place to treat the city’s population. In line with these efforts to renew and refresh the SFGH campus, UCSF is hoping to construct a new UCSF research building at SFGH. 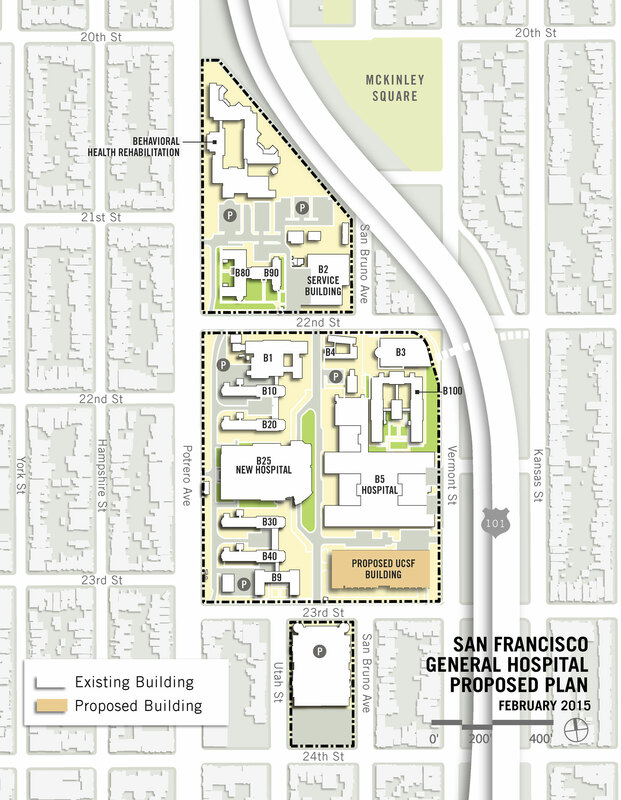 The building would provide modern research facilities, centralize the research efforts that are currently spread throughout nine buildings at SFGH, and allow UCSF to comply with University of California seismic policies. It would house many research centers, affiliated programs and major labs that are dedicated to improving the health of the SFGH patient population and individuals worldwide. The mutually beneficial partnership dates back to 1864, when Toland Medical College opened across the street from San Francisco’s county hospital to provide clinical training for doctors serving the citizens of the booming Gold Rush city. For more than 140 years, the offspring of those two entities – UCSF and SFGH – have worked together to provide the best care for some of the city’s most vulnerable patients. Long recognized as San Francisco’s public safety-net hospital, SFGH provides primary, specialty and hospital care to everyone in San Francisco, regardless of their ability to pay. The hospital also is home to the city’s only Trauma Center. Reducing the risk of stroke among 20-40-year-olds through the “Bring it Down” project. Nearly 2,000 UCSF physicians and staff work side-by-side at SFGH with 3,500 employees of the San Francisco Department of Public Health. In addition to being an essential training site for UCSF physician residents, SFGH is a major research site for UCSF. The hospital receives about $150 million in research grants each year, which accounts for a quarter of all National Institutes of Health grants awarded to UCSF. “Many of our clinicians are physician-scientists and do research dedicated to the needs of our patients. Their discoveries improve the health of our city and impact health worldwide,” said Sue Carlisle, PhD, MD, vice dean of the UCSF School of Medicine. Each year, more than 4,000 cases are treated in the SFGH Level 1 trauma center. Of those, about 1,100 involve some sort of musculoskeletal injury – usually resulting from car or motorcycle accidents, or a fall – and more than 200 are admitted for orthopaedic surgery. According to Theodore Miclau, MD, chief of orthopaedic surgery at SFGH, research informs every aspect of his clinical practice. “We incorporate a research component into everything we do and focus on translational problems that directly benefit our own patients, while paving the way internationally,” he said. Miclau’s team has adopted a true bench-to-bedside approach that encompasses every aspect of orthopaedic research – from molecular biology and biomechanics lab work to traditional clinical and procedure-based studies. By examining how bones heal at the molecular and cellular levels, UCSF experts are developing new therapeutic strategies to make bones heal faster and then offering those therapies to patients at the hospital. UCSF’s research programs at SFGH are currently housed in several buildings at SFGH, including the historic brick buildings that line Potrero Avenue. Proposed location of the new UCSF research building. Click on the image to see larger. These buildings no longer meet UC’s seismic safety standards and UCSF’s research operations must be relocated by October 2019. The proposed site for the new research building is the parking lot adjacent to 23rd Street. Approximately 800 UCSF employees will work in the new building, including 200 UCSF physician-scientists and clinicians. Earlier this month, San Francisco’s Health Commission unanimously approved a resolution supporting the first step in the approval process – a non-binding term sheet. The Board of Supervisors will consider the proposal in June. Following approval by the San Francisco Board of Supervisors and the UC Board of Regents, UCSF will complete an Environmental Impact Review (EIR). After completion of the EIR, it is anticipated that negotiations on the ground lease will be finalized and approvals sought by the Board of Supervisors and Board of Regents in Spring/Summer 2016. Learn more about the proposed UCSF research building at SFGH.